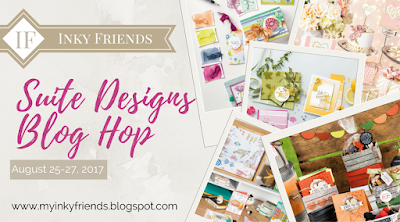 There are two of us designing using this suite so you'll have plenty of inspiration from this hop! Did you come from Sara's post featuring Just Add Color Suite? Or perhaps, you came from Sharleen's Pick a Pattern Suite post. The Suite from the 2017-2018 Stampin’ Up! Annual Catalog that spoke to me right away was the “Coffee Break Suite.” I’m pretty sure that I squealed when I turned to that page. I love the theme, the colors, the size of the elements — everything! 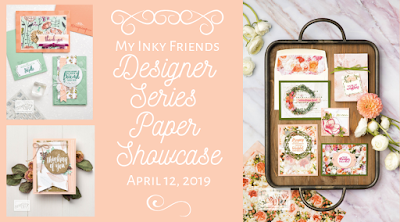 This card features the wonderful Coffee Break Designer Series Paper and the colors are taken from there. I started with a side-fold crumb cake card base and added a layer of the “pots and cups” DSP that is 4-1/4” x 3-5/8”. I stamped the Happiness saying on a piece of Soft Sky that is 2-1/2” x 2-3/4” off to the left side with Early Espresso ink. I added a wrinkle of Whisper White Classic Weave Ribbon at one corner and then adorned the element with one of the coffee pots fussy cut from the DSP. Time to brew it old-school and share a pot of coffee with a friend! Stamping and die cutting is the focus of this card. I had Donny & Marie running through my head as I was stamping this, feeling like drinking iced coffee out of a Mason jar was “a little bit country” and drinking a frappe-style beverage from your favorite coffee shop was “a little bit rock ‘n roll”. Get it? You’ve got a Soft Sky card base here, with a Whisper White layer and a 4”x2-1/4” piece of DSP at the bottom. I used the Ronald McDonald House set “Sharing Sweet Thoughts” for the Mason jar and sentiment. I used the Coffee Café stamp set for all other elements including the wood grain behind the sentiment. I loved on my Big Shot and appreciated the ability to cut out the jars, cups, straws (! ), and coffee beans with Framelits. I used my Watercolor Pencils, blender pen, and even a bit of Wink of Stella to make the drinks look delicious. Here I am CASE’ing the catty, again! I loved the Happy Birthday card shown on page 80 in the 2017-18 SU! Annual Catalog and recreated that in a more monochromatic style. I used four patterns from the Coffee Break DSP, cut into squares and rectangles, and arranged on a Whisper White top-fold card base. I used the Scalloped Tag Topper punch to trim both ends of a 2” wide strip of Soft Sky cardstock to make the focal piece. The sentiment was stamped on top with Soft Suede ink and overinked with an Early Espresso Stampin’ Write marker. I ran a piece of Soft Sky Classic Weave Ribbon through the focal piece and tied a knot on the right hand side. I created a little tea gift packet for my daughter who returned to college yesterday. (Go, Loggers!) I used as my packet the cello outer envelope that my Coffee Cups Framelits came in! I slid in a piece of Pear Pizzazz cardstock that is 5-3/8” x 6-3/8” at the back. Then, I layered in tea bags, accessories, and a spoon and sealed it back up. I wrapped a 2” x 12” strip of DSP around the outside and tied a bow with the Whisper White Classic Weave Ribbon. This is such a beautiful ribbon to work with! To finish it off, I stamped and die cut and assembled a mini teacup with tea tag. Do you ever flip through the Stampin' Up! Catalog and squeal at the beauty of the suites of projects? Do you ever HAVE to have EVERYTHING in a suite? 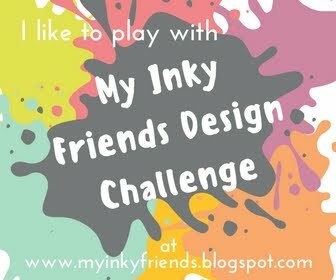 Well, My Inky Friends did just that this month! Each of us picked a Suite from the Annual Catalog and worked our magic! 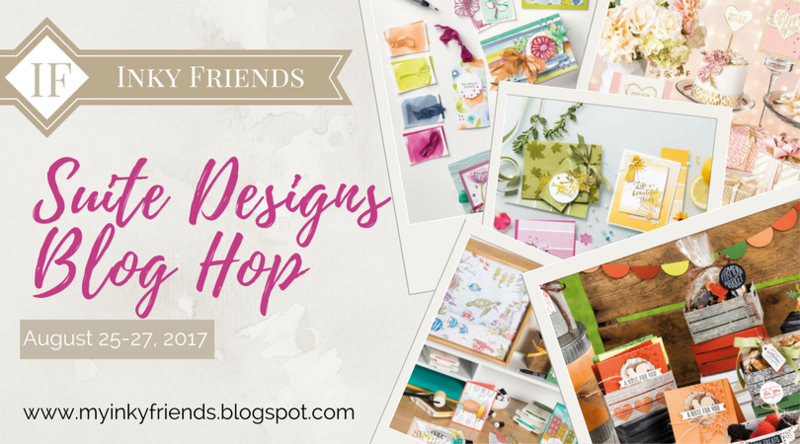 Welcome to the Suite Designs Blog Hop! Which Suites got your attention? Do you have a favorite? Well, you might want them all after you hop through our designer's blogs. Here is our official list. Posts will be up and ready by noon on Friday, August 25th!